Ocean acidification and climate change at the Paris talks. On Nov. 30, more than 140 world leaders, including President Obama, will meet in Paris for the beginning of a historic two-week conference on climate change. There’s already been a flurry of voluntary national pledges, increasing confidence that the meeting will likely result in the first global agreement on emissions reductions. What they won’t be discussing, however (due to diplomatic quirks), is the effect of climate change on the world’s largest and most important ecosystem: the oceans. This year’s record-setting El Niño is fast-forwarding the effects of climate change, and it’s hitting the oceans hardest. 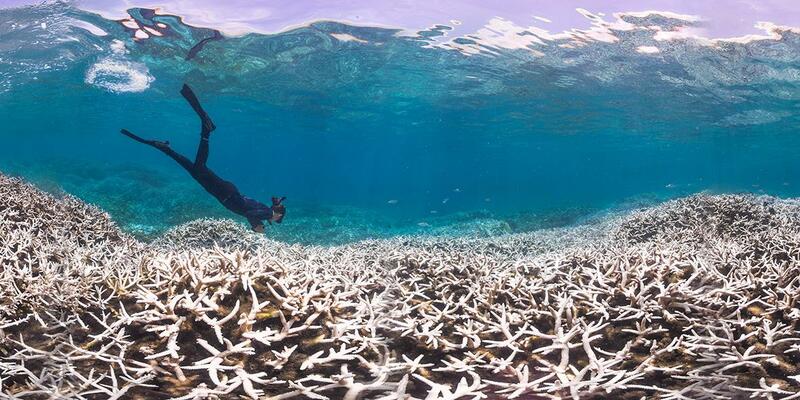 As the ocean warms, coral reefs are already faltering. Sharks, which have been around for 450 million years—about 100 times longer than our hominid family—are vitally dependent on coral reefs. If all the other stresses they face don’t do it, the loss of the world’s reefs might do them in. An even worse problem than rising ocean temperatures is acidification. As the oceans absorb carbon dioxide from the atmosphere, it’s converted into carbonic acid—and the pH of seawater declines. This is like being trapped in an acid bath for marine animals with hard shells. A striking study last year showed that tiny snails are already having their shells dissolved. Another study this July said that a continuation of business as usual would force an “effectively irreversible” change on ocean ecosystems this century. It gets worse. If we can’t count on the ocean’s productivity, what else may begin to unravel? Plankton produce half of the world’s atmospheric oxygen, and oxygen levels are already declining. There’s no serious threat—yet—to those of us who breathe air, but with the Earth going through geological-scale changes in the span of a single human lifetime, it may not always be that way. This is what is meant by the phrase: tipping point. To use an obvious pun, our planet is in hot water. Some scientists, like the University of Hawaii’s Ruth Gates, have begun to bridge the gap between conservation and mainstream oceanography. Gates and her team are using a technique called “assisted evolution” to essentially breed generations of new coral ecosystems suited for the Anthropocene, which they plan on eventually transplanting back into wild reefs. In his decades of environmental advocacy, Safina has noticed what he thinks is a fatal flaw in humanity: “We think that our capacity for technology means that we can do anything.” But climate change is something different. For the first time in Earth’s 4.5 billion–year history, a single species has put the lives of nearly all others in jeopardy. Now that we’ve finally realized the mess we’re in, we can’t seem to stop perpetuating it. “There are problems that humans simply might not be psychologically and sociologically capable of dealing with appropriately on the appropriate time scale,” Safina said. The terrorist attacks of a few weeks ago are still fresh wounds. In the days immediately following, it was briefly an open question whether the talks might be canceled for security reasons. Ultimately, several unofficial but important aspects of the meetings were, in fact, canceled—and that’s unfortunate, but understandable. But the most heartwarming response was from the French president, François Hollande, who refused to entertain any discussion of canceling the talks. He called the forthcoming climate summit “a time of hope and solidarity.” Let’s hope that beautiful sentiment is enough to inspire real progress. That’s the biggest problem with climate change action—the plankton, mollusks, and corals have no seat at the table. If—selfishly, even!—we want to have a planet where human civilization can thrive for decades and centuries to come, we can’t forget about the oceans.